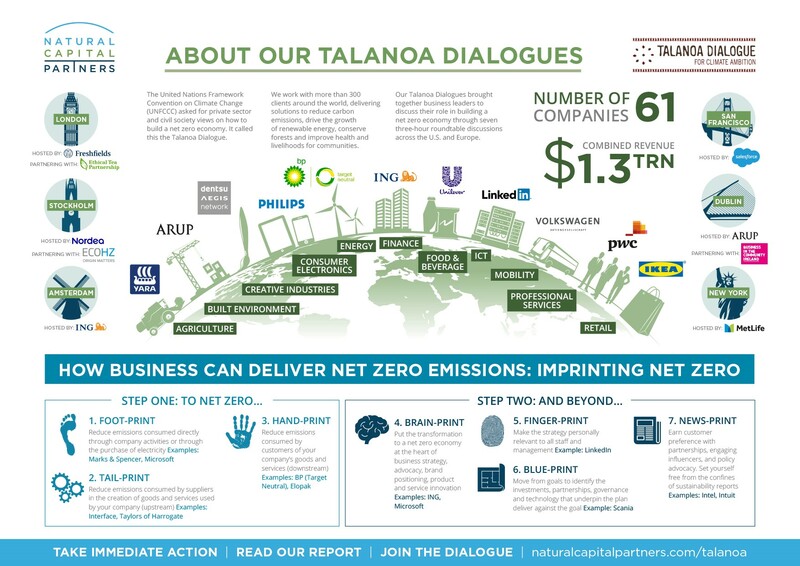 Last month Business in the Community Ireland participated in Natural Capital Partners’ Talanoa Dialogue.The Talanoa Dialogue is a United Nations Framework Convention on Climate Change (UNFCCC) initiative to gather private sector and civil society views on how to accelerate progress towards net zero emissions. Natural Capital Partners hosted round-table discussions across Europe and the U.S. with 61 corporates with collective revenues of $1.3 trillion.The corporates described seven ways they are taking climate action,described in the ‘Imprinting Net Zero’ model. It outlines what all businesses can do now to take immediate climate action and what climate leaders can do to extend impact and commercial opportunity. In addition, it identifies that government action is necessary to unlock the full potential of private sector action: offering up 10 recommendations to the UNFCCC. progress towards net zero emissions.